I just finished up the third day of this weeks adventure session and I just don’t think it gets any better than this!!! There just wasn’t enough hours in the day for us to do all we wanted. Every place we went and everything we did was an absolute blast and we all had fun like their was no tomorrow! I was joined by three more new adventurers today, AdventureAlgis, Linas and Paulius, all the way from the Republic of Lithuania, a country on the southeast shores of the Baltic Sea sharing borders with Latvia to the north, Belarus to the southeast, Poland, and the Russian exclave of the Kaliningrad Oblast to the southwest. Talk about adventurers, not only could these boys swim, they knew how to travel and even spoke a few words of English. So we got along great! And one thing they knew for sure was how to have fun, and they came to the right summer camp! I can guarantee that! With AdventureDavid and Dina from Hungary and Adventure Algis, Linas and Paulius from Lithuania my summer camp, AdventureMike’s, has gone international, and it has been Fabulous!!! From here on out, the skies the limit. Right on! With AdventureAlgis, Linas and Paulius joining AdventurersJason, Jordyn, Christopher, Trevor, Gunner, Jagger, Michael and Chaz I had a full boat load, and I knew I was going to have my hands full! I knew this would not be a problem though, I am well seasoned by now after months like this! This is a great group of kids, knows how to swim, and DEFINITELY knows how to have fun!!! And that makes my job easy, at least on days like today! 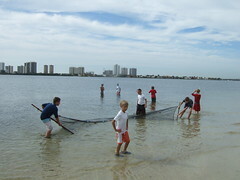 We decided we would head straight for Little Munyon Island to do some seine netting while the tide was still low. 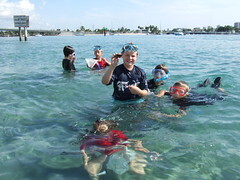 AdventureJason, Jordyn, Michael, Gunner, Trevor and Jagger took turns pulling the seine net thru the shallows while AdventureAlgis, Linas and Paulius went snorkeling with AdventureChaz looking for starfish, sea urchins and large sea grass hermit crabs. By the time we were finished seine netting the adventurers had found juvenile barracudas, hogsnappers, striped grunts, caesar’s grunts, french grunts, small mouth grunts, tomtates, pinfish, porkfish, mutton snappers, yellowtail snappers, gray snappers, mojarras, filefish, pufferfish, pipefish and even a few scorpionfish which we were careful not to touch. These were just a few of the many “treasures” we discovered. While we were having fun doing this, my Lithuanian Adventurers were discovering all sorts of cool things besides just starfish, hermit crabs and sea urchins. They saw eagle rays, crevalle jacks and even a pile of small lobster under a rock in 3 feet of water. Now that’s having FUN!! !, especially when you are from Lithuania!!! I could hear their excited voices all the way back to the boat! I was loving it! We went to Big Munyon Island for a really cool island hike, checked out the estuary for finger mullet, the backside of the island for horseshoe crabs and hermit crabs, the wild coffee and knickerbean plants scattered about, and we even checked under the rooftop of the picnic area to find 2 different type nests of 2 distinct species of mud dobber wasps. One type built a group of single family nests while the other built condos. Just like us. Now that was cool to see! 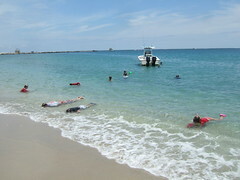 We walked back along the beach to the boat and headed to the sandbar to swim in the Big Hole. Along the way. we stopped at Starfish Prairie, picked up a few very large Cushion Seastars to show the group, released them, and off we went. We arrived at the Deep Hole along the sandbar and the water was perfect! Just the right depth and perfectly clear! The way we love it! It was full of menhaden and the snook and small barracudas were having a feast. The menhaden would spray out of the water trying to get away from the hungry fish below while the terns and sea gulls were having a feast from above. There was action in every direction and we were loving it. We checked out the West Indian and Florida fighting conchs laying eggs and found that the West Indian species out numbered the Florida species by about 3 to 1. Along the way, AdventureJordyn found the smallest Beaded Sea Starfish I have ever seen. It wasn’t a half inch in width. They are not just uncommon around here, they are downright rare, and to find one this size, unbelievable! I thought it was great, and the coolest thing was that the smallest adventurer aboard would find the smallest beaded starfish I will probably ever see my whole life. Now that’s neat, and I have searched alot! After this we went to the Rock Garden, dropped anchor and got in. And low and behold what did we see? That’s right, thousands,and I mean thousands of fish in every direction! One of the best days ever! And how was the visibility? That’s right, crystal clear! It just doesn’t get any better than this! We watched hundreds of blue runners and snook eat menhaden till their hearts, and stomachs content. All within inches of our masks. Just great! AdventureMichael, Gunner, Trevor, Jagger, Christopher and Jason caught all kinds of swimming crabs, blue crabs, seaweed blennies and hermit crabs, while AdventureJordyn, Linas, Chaz and Paulinus were content swimming amongst the tropical fish and watching parrotfish, surgeonfish and spotail pinfish graze on the algae covered rocks. By now we had only 45 minutes left so we climbed in the boat, had a quick snack and some drinks, and decided to head out to the beach since the ocean was as calm as a swimming pool. We drove around the south jetty and dropped anchor a few hundred yards down the beach 10 feet from shore. The water was crystal clear, the beach full of shells and hundreds of juvenile pompano and permit were feeding on sand fleas in 3 inches of water. We were loving it all! The days just don’t get any better than this! 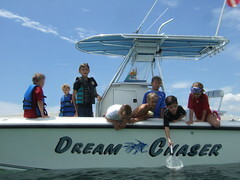 Blue skies, clear calm seas, thousands of fish and a great group of adventurers enjoying their day. Now that’s living!!! When it was time to go, you know, not one of us was ready to call it quits. And especially my group of Lithuanian Adventurers. Even they, with there limited knowledge of English, let me know they wanted to stay longer! And they sure knew how to say FUN while they were having it!!! Today was one of those truly blessed days and even though AdventureAlgis, Linus and Palius spent only one day with me, I know they will never forget it! When we arrived back at the dock and I heard them excitedly talking to their mom about the day I knew things just didn’t get any better than this! I knew every one of us had fun today! And the best thing about it all, there is one more day of ADVENTURE and I just can’t wait till tomorrow!!! Its fishing day!!! And you know what that means!!! We’re going to have fun, catch fish and live the adventure!!! We’re going to have some FUN!!! Right On!!! God, I love my job!!! Yippee!!! !